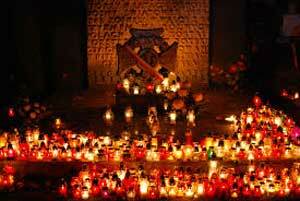 All Saints Day is also known as All Hallow and honors people that have died. It is celebrated on November 1st each year. Most people visit church services, place flowers loved ones graves, and visit cemeteries. Most buildings are closed other than railway stations and airports. All Saints Day was first celebrated on May 13th 609 C.E. When Pope Boniface IV accepted the Pantheon as a gift from the Emperor Phocas, the Pope made the day a holiday to honor the Blessed Virgin and martyrs.